The acuity of patients being seen and treated in primary care is changing. This article substantiates the gap in current practice and shows the effect on primary care healthcare assistants’ (HCAs) confidence of providing a course that covers the knowledge and skills needed to recognise and respond to a deteriorating patient. 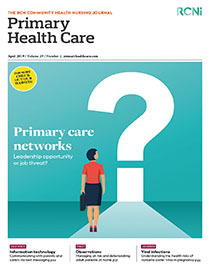 It discusses the changing acuity of patients being seen and treated in primary care and shows how a course initially developed for hospital HCAs has been adapted for primary care. The primary care staff course bedside emergency assessment course for healthcare (BEACH) helps HCAs to recognise and take specific action to ensure that safe and competent care is maintained through early recognition, supported decision-making and prompt escalation of deteriorating patients.